At SAI KIDS Foldscope Club, we not only teach microscopy. We also want the learners to be able to use what they learn in their daily life. For last Saturday’s session, we tried to teach the concept of Division of Labor. Using the different parts of a plant, we explained how each part is important for the whole system to work efficiently. Before the learners started their experiment, they first had some games as an introduction to the topic. They also saw some pictures of family members doing different chores at their home. Then the learners were divided into three groups. Each group assigned a member for the preparation of samples and documentation. When all groups finished preparing their samples, all the members used the Foldscopes to examine each sample. Each group has a stem, leaf, and petal samples of a gumamela or hibiscus plant. After that was group discussion. Mr. Johnson Donato explained to the learners how the cells of each sample works. KIDS Club Founder Anna Budich also joined the session and explained about photosynthesis through videocall. The learners observed that the cells from each sample were different in terms of color and structure. They also learned the important roles of each part to help the whole plant function well. 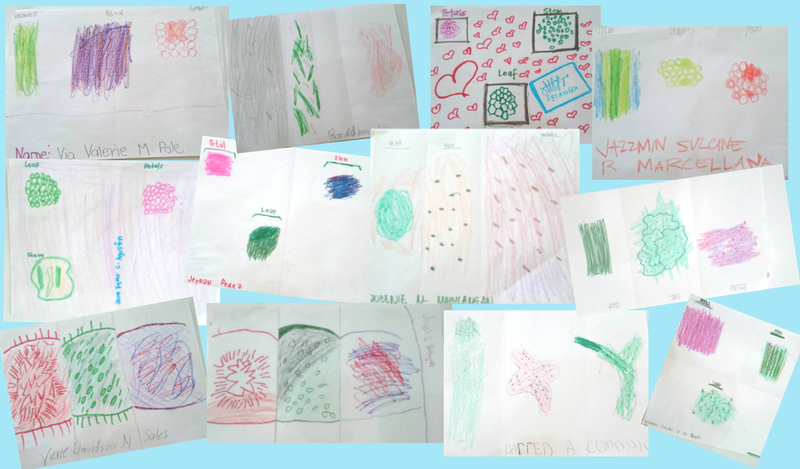 And to document their findings, the learners drew the images they saw from the Foldscope lens.